I use two mini greenhouses that I fill with newspaper pots planted with seeds. While you can use dirt from the garden I usually use sterile potting soil to cut down on mold and other organisms that can kill off young seedlings. Once everything is planted I water it, put the plastic cover on top and mist as needed until the seeds begin to sprout. Once this happens I take off the cover and put them in a west facing window. – A T8 Florescent light fixture from the hardware store. T8’s are a good and less expensive option than T5’s. This fixture comes with a chain and power cord and costs about 18 dollars per fixture. – Light timer – find one that takes 15 watts and can be set to the time of day. The power strip plugs directly into the timer. The cost for the timer is about 15 dollars. Once I get these supplies I will hang them from the top of the window on adjustable chains so I can keep the light about an inch above the level of the growing plants. 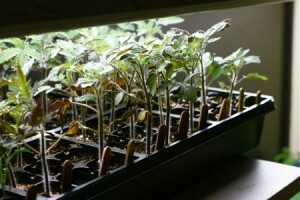 For more information on growing your own starts with a Grow Light system, click here.